This honey do bridal shoot was themed after the classic ‘honey do list’ that wives give their husbands....except this is one is extra sweet! Our honey-do list includes: buy me flowers, wear my favorite cologne, sing in the shower, let me win at everything, always kiss me good night, just to name a few. It's certainly the sweetest honey-do list there is!! 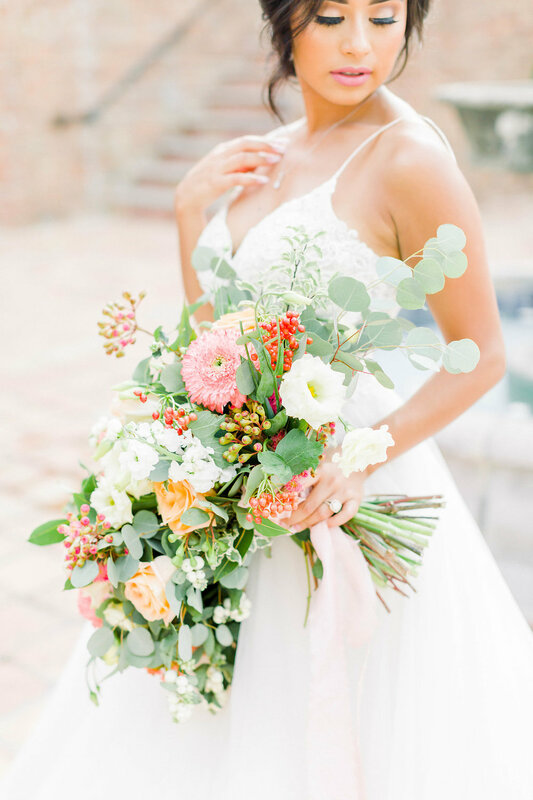 I am so thankful this beautiful shoot was featured on Wedding Chicks! Please check out the link for more inspiration behind this shoot. Why I Love Film Photography! I love all things romantic and film photography has to be one of the most romantic art forms I know of! Film photography has a way of capturing some of the purest expressions, richest colors, and sincerest moments. So when it came time for my beautiful client Ariene to have her bridal portraits taken, I immediately suggested that she capture the session on film. 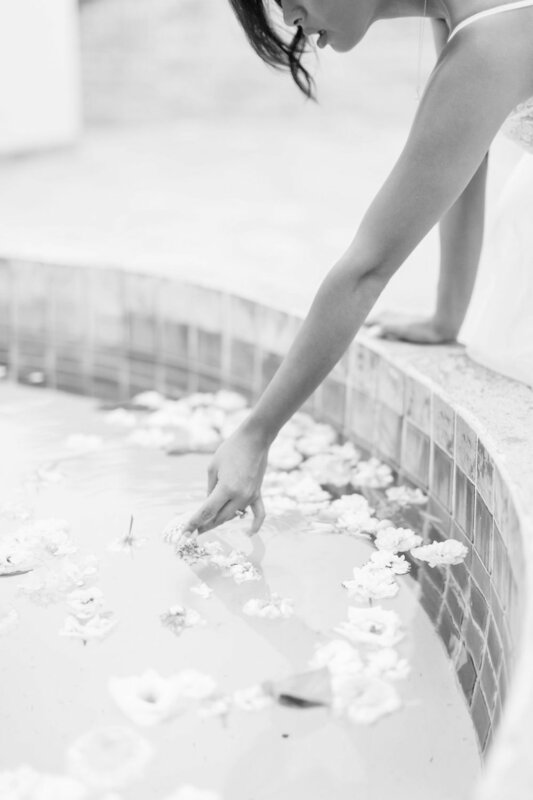 The very talented Brittany with Brittany Jean Photography helped to execute a nostalgic and dreamy bridal session! She captured Ari swaying in her dress; full of anticipation and excitement for her upcoming wedding day! Some of my favorite images came from her graceful touch of a love note balanced perfectly on this fitting vintage music stand. The whole bridal session just rang of natural sophistication which speaks true to this brides heart. Seeing these images captured on film just intensified the moment. It added a great classic feel to a traditional event and I was so glad I was there to see her through it! I suppose that’s why I love film so very much… it holds a tradition in a perfectly raw form. One of my favorite things to do is play around with color pallets! This past fall I had an amazing time designing a Fall Fiesta Couples Shower for my dear childhood friend Cindy and her fiancée Morgan. I wanted the atmosphere to be playful, bold, colorful, and exciting to complement their personalities and beautiful relationship! There were so many amazing elements to this event, but my favorite thing about this event was that it encompassed an good old fashion house party! The location was in the backyard of a beautiful family home and added just the right amount of sentiment to the occasion. Guest kicked backed, enjoyed a cold one, played yard games, and savored amazing Houston Tex-Mex. I also loved seeing the table design come to life! It was elegantly styled, but still comfy enough to make her guest feel right at home. Holly and Hunter with Flower Vibes did an amazing job executing these amazing centerpieces that brought the whole event full circle! I've known Cindy since the 4th grade, so I thought it would be fun to create a handmade guest sign in table! I busted out the pencil box and put my markers, scissors, and glue stick to good use just as we did in the 4th grade! Guest were allowed to leave suggestions for a date night, wishes, and advice for the happy couple! It was a great way to remember all who attended as well as a sweet keepsake for Cindy and Morgan. Overall, I couldn't have been more honored to be apart of this special day for Morgan and Cindy and wish them both continued happiness together. It's one of those "forever told" stories that a couple never forgets and a prelude into the journey you're about to take as one. Similar to marriage, the proposal formulates a once in a lifetime memory that will be cherished throughout your days together. To help those planning a proposal, There are three key elements that can formulate a memorable proposal. It’s more than just pulling a ring out of your pocket and getting your knee dusty. Planning a proposal takes months of advance planning, and of course a good starting point is picking out a fitting engagement ring! By this time you may have already received a few indications regarding the style of ring she likes best. Take those hints and visit a jeweler that can help you create a custom ring that is best suited your future fiance. This ring from Brian Gavin Diamonds is simply remarkable and one of a kind. You can’t help but drop your jaw as soon as you see it and she will too! Next, pick an exact location that gives off that old saying “love is in the air”! There are just some locations that exude romance and The Gallery is certainly one of them. This venue radiates with French-Mediterranean charm and its beautiful architecture simply makes for a breathtaking atmosphere which in turn will help you create a breathtaking proposal. Also, don't forget to set the table! Adding an intimate table setting to your selected location will show the great deal of planning you've done to make this moment special. Finally, take time to map out exactly what you want to say in this special moment. I personally love the idea of this custom written proposal created by In Loft Calligraphy. It’s complete with an exact illustration of the proposal and stamped with an unforgettable expression of love! Presenting a custom note is a beautiful keepsake that can be kept forever, and with all the excitement and blinding bling, she will always have a way to look back and remember exactly how you proposed, right down to the very word. Getting engaged in the lucky hat she bought you years ago is a cute idea, but if your asking her in a public location you will want to look presentable and suited for this special occasion. I guarantee that after you get your knee dirty, you can count on your now fiance wanting a shot of you two together. So, find a stylish suite that makes it hard to say no. In addition to your stunning attire, amaze her with a thoughtful proposal outfit as well! This beautiful dress from BHLDN screams I’m in love and my heart is twirling around with anticipation. and these dazzling high-heeled shoes create the perfect addition as she steps into your new journey. Also, send her to get her hair and makeup done before the big evening together! A pretty outfit and chic makeup application will send your soon to be fiancée out the door looking and feeling her best! Finally, the best way to create a memorable proposal is by the means taken to capture it! The look on her face when she realizes that the proposal is actually happening is an expression you will want to hold on to for a lifetime. This is why I encourage you to hire a photographer that can truly encapsulate the emotion and reaction of your future wife. Debra Mason with Fully Love Photography is one of my absolute favorite photographers to work with. Her attention to an individual expression and personal details is like none other! After all that preparation you will want to be able to relive the story through those magical images. Plus, these photos can serve as a save the date for your upcoming day! Although planning, surprising, and encapsulating are the base elements to your memorable proposal, this momentous experience in its self if specific to the individual your presenting the question to. With that said, the final element to the perfect proposal is you! After all, you’re the one thing she can’t live without! So honored to be featured on Inspired By This along with all the amazing vendors that contributed to this photo shoot! Click the title link and check out all the amazing inspiration initiated by Renee Streett owner of Domus Aurea! The average cost of weddings can be a daunting figure to young engaged couples looking to tie the knot. However, there is a way to get the day you dreamed of and stay within a reasonable budget. One way to do this is by eloping! As romantic as it sounds, you do not have to run away to Vegas in the middle of the night and be married by an Elvis impersonator. Eloping can be tasteful, meaningful, and executed in a loving fashion. Find a location that sets the tone of your big day. 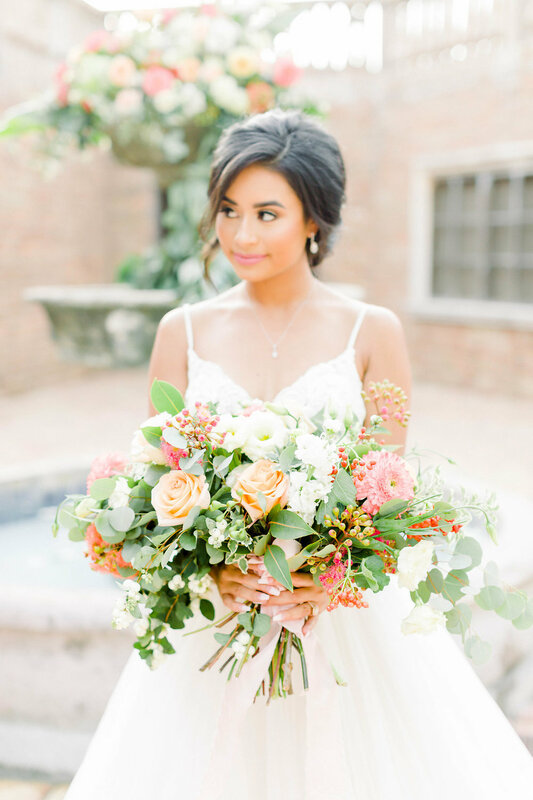 For this styled shoot, I picked Moody Mansion in Galveston, TX. This historic venue is full of old world romantic charm and the perfect place for a private and intimate elopement. 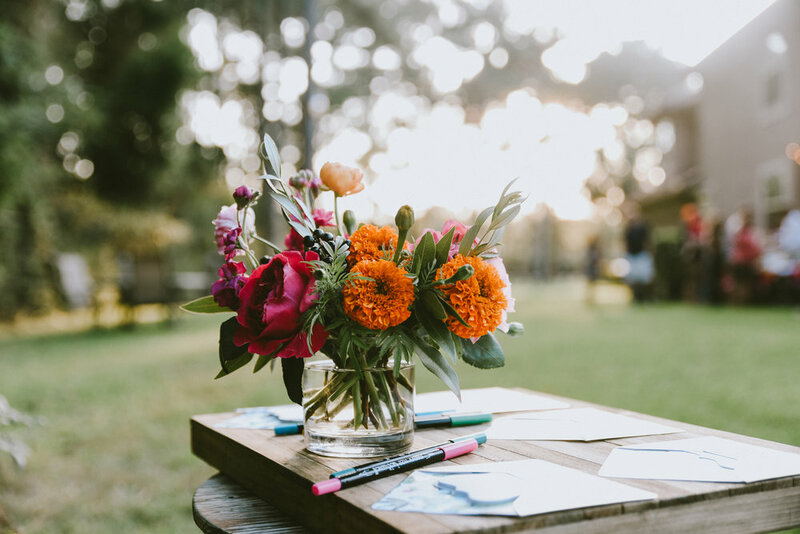 Focusing on a few details can have a major impact on the overall feel to your elopement. Take for example this intimate sweetheart table. 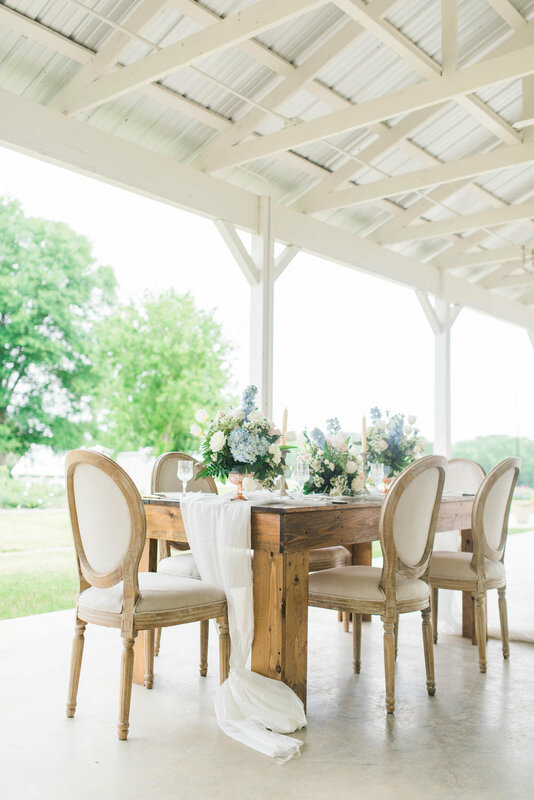 The conservatory made the perfect backdrop to this chic and simple sweetheart table provided by Steffany with Rent Some Vintage. The lovely, plush floral design executed by Maryann Webb with West Side Flower Girls made an eye catching focal point! Christi Eastham with Cecalligraphy helped to me to display a simple note that brings the elopement to full circle on the dinner plates, "It was always you". Just a simple reminder that it starts and ends with just the two of you! All of these details add up for a memorable elopement dinner! I also love this sweet love poem displayed on the table! Ivon and Patrick with Inloft Calligraphy did an amazing job making this love note look so very sweet! The hand drawn flowers and the pink script wording made this love poem even more romantic! By incorporating some traditional bridal images can bring a familiar wedding feel to your elopement. 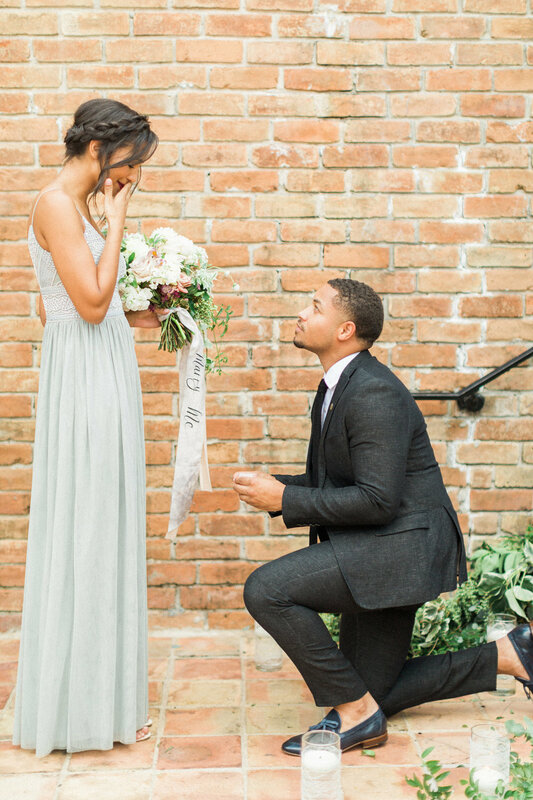 Talk with your photographer to make sure they help you capture these intimate details such as your ring, your shoes, the cake, and dress details! Capture the pure moments of the two of you on this special day! Keep in mind what you want to see when you look back on this special occasion and make certain your photographer understands your vision. Our models Danielle and Vinc did just this during their "bride and groom session" as displayed here. 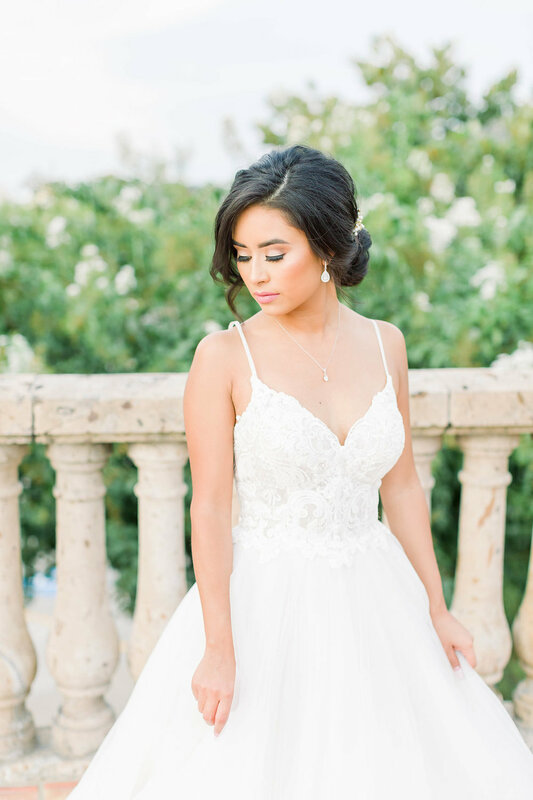 Your wedding dress is delicate, graceful, and an intimate part of your personality that will be showcased on your upcoming celebration; and if there is ever a garment that should be remembered along with your bride to be smile, it’s your wedding dress! I couldn’t agree more, and it is one of the main reasons I encourage brides to take traditional bridal portraits. I remember trying on my wedding dress and falling in love with the way it was going to be bustled as I strolled among all our friends and family. Quaint details such as these should be captured, but may get lost with all the bubbly commotion of the wedding day. Having a day dedicated to you and your dress will ensure those sentiments are remembered forever. The extravagant train on this BHLDN gown is an unforgettable detail for the wedding dream books! Bridal portraits don’t solely have to be about the dress. I encourage brides to implement other wedding day influences such as their ring, sweet treats, invitations, and inspired décor as well! This blue topaz diamond ring from Brian Gavin is so unique and undoubtedly a highlight that expresses the individuality of a special bride! Another way to express your distinctive bridal persona is through a custom invitation. I absolutely love this invitation set created by In Loft Calligraphy! The details are phenomenal and very well executed; right down to illustrated gold doors inspired by The Folmar's one of a kind rustic chapel. 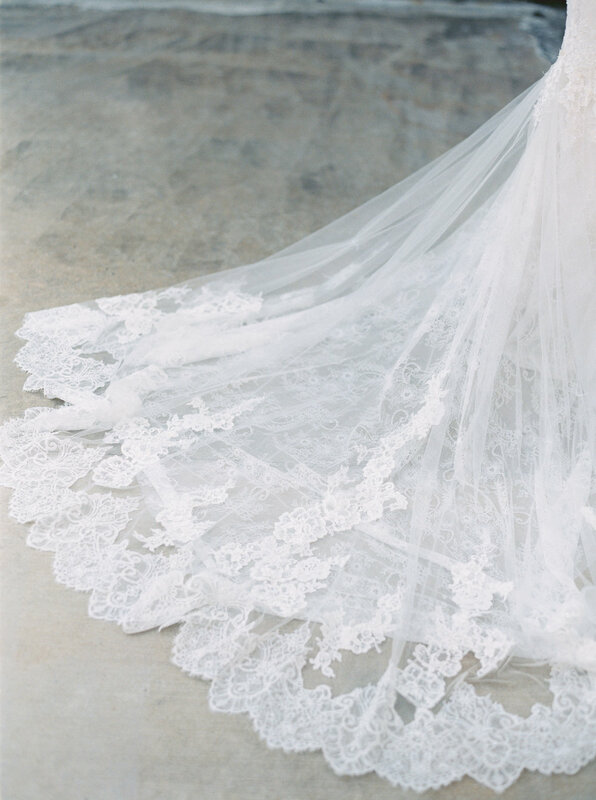 Capturing this detail is certainly a great way to achieve a swanky bridal portrait session. To make your session even sweeter, incorporating simplistic and chic wedding cakes is a fun prop to add to your shoot! Similar to the saccharine textures of the BHLDN gown, these textured white wedding cakes from Dolce Designs brought out the southern and sugary side of the shoot. An alternate focal point to add to your bridal session is a stunning table setting! This setting was inspired by the classic countryside ambiance that radiates as you arrive at The Folmar. The entire event space brings on a beautiful stillness that makes you stop and take in the natural splendor around you. 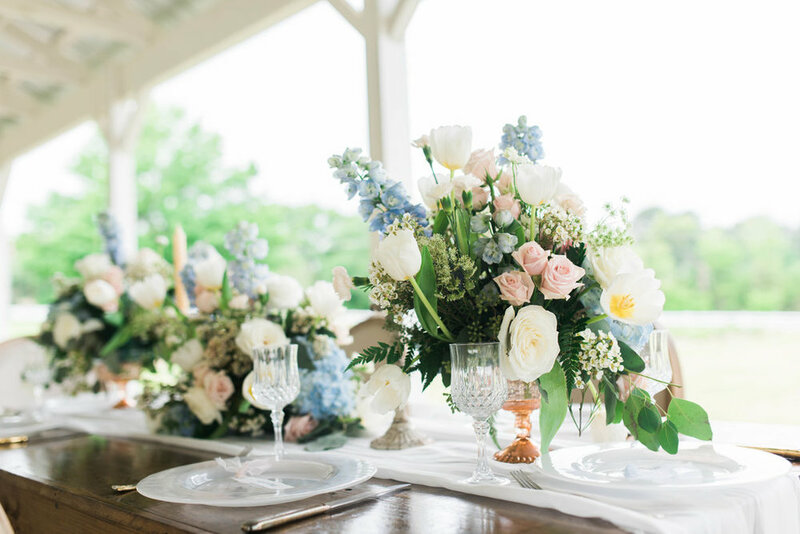 I wanted to keep that same sense of calmness with this tablescape; applying soft creams, pastel blues, and supple pinks. E-Johnston Designs did a wonderful job executing the vision with angelic blooms. The white chiffon table runner mirrored the train on this wedding gown to perfection and candidly brought this bridal portrait session full circle. Overall, bridal portraits are about capturing the monumental moment in time before you take the first steps towards into your new forever. However you decide to do them, make these photos uniquely geared towards the things that you never want to forget about your upcoming big day! I loved seeing this Alice in Wonderland Inspired baby shower come to life! I started by selecting a intimate venue that had just the right setting for this theme. 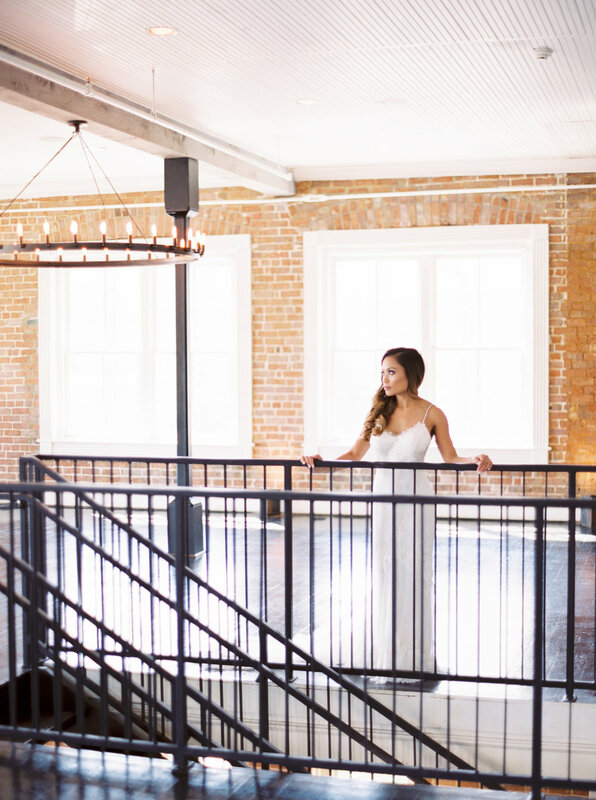 The Down House Houston is perfect for any kind of shower celebration. It has an intimate semi private room that accommodates 16 people, which worked perfectly for this clients needs. The decor I implemented carried a distressed/preppy feel! Frayed girly bows, worn vintage books, and classic ceramic dishes pulled the whole room together and complimented the decor perfectly. The wood signage provided by Jaime Lewis Artistry help to set the tone for the incoming guest as they were able to receive a sense of the theme as soon as they walked through the worn, chippy front door. My favorite decor pieces were the Alice in Wonderland Peg Dolls and the custom cake topper! 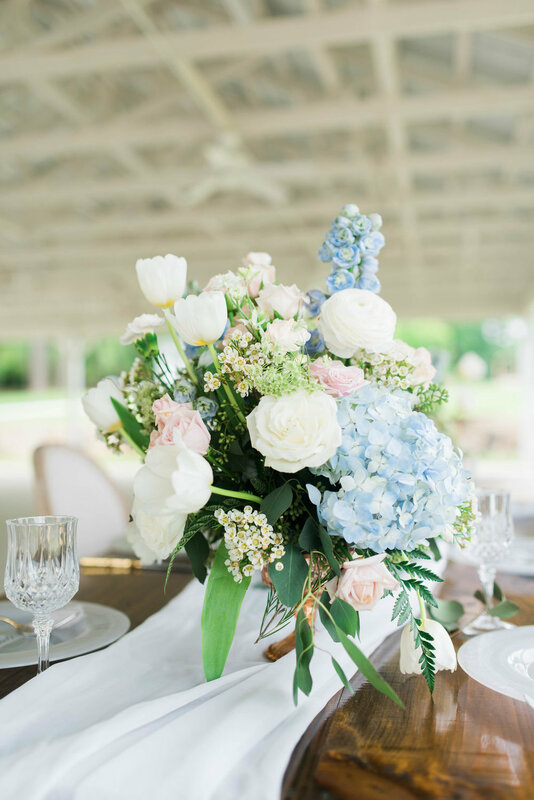 Both added a mature and sweet sentiment to this intimate baby shower! As shown here, this date night at the carnival theme is a fun way to show your little bundle of joy how excited you are about their arrival! What I love most about this concept is that your are able to act naturally with out to much posing. Take a stroll on Pleasure Pier, grab a pop-sickle, and have some good ol’ fashion fun to show that although your parents now, you still know how to have a good time! The festive colors of Pleasure Pier made for an excellent backdrop as Leah and Dustin walked hand in hand on their date night. Sharing a sweet kiss by the vintage inspired carousel was the perfect ending to this entertaining maternity shoot! A very special way to remember your baby bump is through a milk bath maternity session! A beautiful garden tub lined with fresh floral buds and greenery made for a relaxed and serene enviroment as displayed here. Leah and her bump posed with such elegance during this session which resulted in the sweetest images for this mom to be! While guest waited for the reception doors to open, they grabbed a box of popcorn at this self serve popcorn bar. Loved seeing the guest enjoy their gourmet snack and best of all, it was easy and affordable to implement! Wedding Cake and Coffee go hand in hand! So I implemented this adorable coffee and tea bar with a vintage flare! I used an antique silver coffee set and lined the edge of the table with Harney and Sons tea can with dried flowers. It was the perfect set up for this sweet wedding! Loved Seeing this S'more Lovin Favor bar come to life! This was put into place just for the kiddos at this backyard bbq wedding. towards the end of the receptions we broke out the skewers and started a campfire! The children were entertained and enjoyed their wedding favors right there on the spot! Sometimes you just want to send a message that says "HEY DRINKS OVER HERE!" I loved adding just a touch of decor to this wooden bar by implementing lace wrapped bottles and a rustic garland banner! At this backyard bbq wedding, the bride wanted guest to be all hands on. So we incorporated this self serve bar with wine, beer, and soft drinks for guest to help themselves to. I added a 6ft lace backdrop that served at a duel selfie station. Guest loved the ease of getting a drink, and having a photo opp all in one! Take A Seat & Enjoy the Vibe! From Chic Brown Brides: We love unique ideas for bridal showers, especially those that cater to your style as a bride. Today, we’re sharing bridal shower inspiration with a Victorian flare. Our favorite part? The incredible attention to detail and vintage feel from the tea cups to the brides dress. Take a look below and get inspired! This styled shoot was put together for the Galveston Island Convention & Visitors Bureau. They hosted a three day weekend for writers and editors on the best places to get married in Galveston, TX. I was reached out to by Leah Cast to decorate the Lasker Inn as if we were at a real bridal shower so the writers could optimize the experience for their articles. From The IBT Girls: This pretty family maternity session doubles as a babymoon! We love all the creative ideas Tammy’s Table came up with for this couple and their daughter to enjoy. A sweet desert brunch that served as a ‘day date’ for mom and dad, and a beachfront maternity make up the sweet session. Tammy shares more about her vision for the beautiful babymoon maternity with us below! We wanted to show that couples can turn an average maternity shoot into a luxury babymoon getaway. This shoot took place in Galveston, TX at one of the luxury beach house rentals. Having time together as a couple before the baby arrives can be a beautiful thing and we hope we displayed that kind of inspiration within these photos! We shot this at a luxury beach house rental complete with a private beach just steps away. We wanted to inspire expecting couples to take a vacation or a ‘staycation’ as this family did; enjoy each others company and reflect on the journey they will begin before the baby arrives. This can be done with a special brunch, lunch, or a ‘dessert only treat’ as we displayed. I also loved this part of the session! We asked the entire family of three to come out by the private beach just off the rental house to take family portraits. These photos do have a traditional feel, but the props added great sentiment. In Loft Calligraphy created a custom book “My Book of Baby Names”. I was inspired to have this book created because while I was pregnant I would write down different name ideas on sticky notes which would end up lost. If I had a journal like this I would have used it, plus, it serves as a great memento. Since we were on the beach it only seemed right to have a shell with the family name hand written on it along with a single lace sailboat. Lovely prop idea and again can be used as a memento or family heirloom. Finally, the Cast family was amazing and so great to work with!